Sarcoptic Mange is a parasitic skin disease of dogs caused by a microscopic mite called Sarcoptes scabiei. The mite burrows just under the surface of the skin. Dogs with sarcoptes are very itchy, the dog will chew and scratch its skin constantly. This leads to the loss of large amounts of hair, especially on the ears, legs and belly. Sarcoptes is currently very common in this area. Many foxes in the area are infested and dogs can catch the mite while out walking. Sarcoptic mange is highly contagious to dogs and foxes. 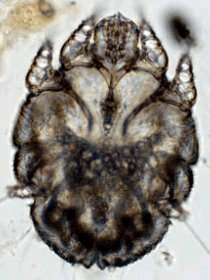 Scabies in people is caused by a close relative of this mite. Some people in contact with infested dogs may get itchy patches, but these will usually clear up when the dog is treated. It is often possible to diagnose sarcoptic mange from the clinical signs alone. Where the diagnosis is less obvious, a skin scraping may be taken and examined under the microscope. Finding the mite on a skin scraping confirms the diagnosis, however it is often not possible to find the mite even if it is present. Treatment is usually straightforward, a spot-on preparation is applied to the back of the dog's neck on two occasions, and the dogs bedding and the carpets are sprayed with an aerosol spray. It is important to follow the instructions carefully.